This month’s Self-Care Sunday series focuses on Sabbath Rest. Today, we’ll explore the connection between creativity and rest and how taking time to rest from creative endeavors is a form of self-care. 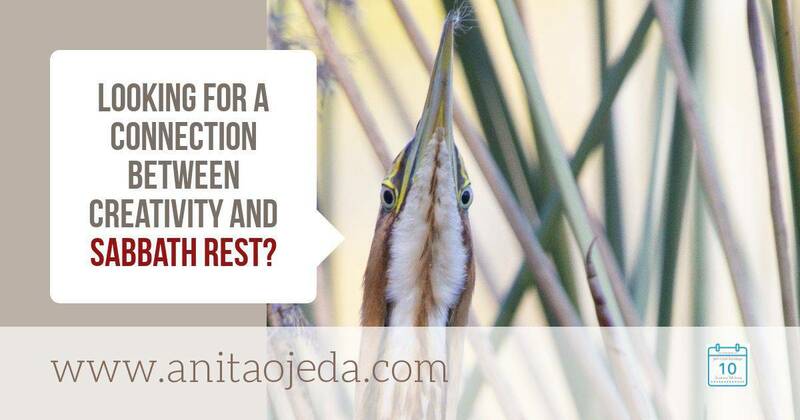 Come back next week when we explore how to nurture ourselves with physical rest. She sent me a photo of what she wanted, and I told her I’d try my best to recreate her vision in a dress that would fit her. Unfortunately, I didn’t have time to find a pattern, and knew I’d have to wing it to create her dress. I also knew that no matter how long those pieces sat on my sewing table, the dress wouldn’t make itself. If I wanted to fulfill my promise, I’d need to roll up my sleeves and get to work. Five hours later, my sweet student had her beautiful blue princess dress. I rushed to pack my suitcase for the trip to Phoenix to take my daughter and grandson to the airport. As we drove, something nagged at me. Perhaps I had forgotten something I needed. Or maybe I had left the iron on. Three hours later, I finally figured it out. In my rush to finish with a project and move on to the next thing, I had forgotten to celebrate. I hadn’t invited the princess dress recipient over to try it on one last time. Nor had I snapped photos of the creation. The failure to celebrate left a little void in me. As I’ve gotten older, I’ve come to understand that in order to feel completely satisfied at the end of a project, I need to celebrate. And by celebrate, I don’t mean throw myself a big party and invite lots of people over to share in my accomplishment. No, a simple acknowledgement that I’ve completed something big and creative will suffice. Perhaps this need to quietly celebrate explains my love of ticking things off a to-do list. Checking the item adds a period to a sentence I’ve labored over. Not all projects require the same level of celebration and rest, but all creative endeavors require some level. The bigger the project, the more rest and celebration we need when we finish it. Our need for celebrating when we finish with creative projects comes from our origin. I am a created being. A Creator God knit me together in his (some might say ‘her’) image. That means that I take after my Creator. We often overlook what God did at the end of creation—he rested and celebrated. So, if God, the Creator of the universe, took a day to rest, why do we think we can hustle along seven days a week without rest? We can’t. Well, we can, but only for so long. Celebration and rest go together like dark chocolate and almonds. When we stop to celebrate, by definition, we engage in rest. Try celebrating while concentrating on your next project. I can’t do it. To celebrate means that we make publicly known, proclaim, to praise, or to observe or commemorate. For many of us, Facebook and Instagram have become the de facto forum for celebration. We create a quilt or a beautiful cake and immediately snap a photo and upload it to our feed. We then eagerly await the likes and hearts that pour in. They validate our celebration. If you read the first chapter of Genesis, you’ll notice a pattern for creatives. Create, review, and proclaim. Genesis 2:2-3 shows us that in addition to the little celebrations as we make progress on a project, we also need full-day celebrations and periods of rest. The Sabbath provides the perfect space to rest and fill up our creative tanks. 1. Don’t do anything creative. It sounds counterintuitive, but remember, you want to celebrate—which means you have to stop or pause. So, put away your quilting project, and take a break from writing. You need to rest. 2. Let your mind revel in someone else’s creativity. Read, enjoy an art museum, listen to music, go to the zoo (a great place to see the results of God’s creativity). 3. Celebrate with someone else. God wants us to do good on the Sabbath. Write a note to someone and compliment them on THEIR creative endeavor. Reach out to an artist or musician and thank them for their creativity through Twitter, Facebook, or Instagram (just don’t get sucked into social media for hours on end). Find a pinecone, a flower, a bird, or anything and spend time examining it. Think about the creative power behind what you examine and celebrate the Creator. What ways have you discovered to celebrate your creativity? First of all, I’m impressed that you were able to complete that daunting project in five hours, Anita! You must be quite the seamstress! The last time I sewed something to wear, I was in Home Ec in middle school! Lol! I did make one pretty nice wrap around skirt, if I do say so myself! Secondly, I LOVE your point here. I’ve never even thought about the need to celebrate after a project and/or how celebrating and being creative can’t really happen at the same time! Great thoughts, my friend! I’ll be pinning and tweeting! I really enjoyed your article, Anita! It answered a question I as praying about today – take a break from writing. I am participating in the #write28days challenge, and after 7 days I faced the conviction to rest on Sunday or push through and complete. Then I was reminded of a YouTuber I follow who holds monthly challenges, yet takes the weekends off, and allows her followers the weekends to catch up as well. What a wonderful way to not only celebrate but to honor your creative work by taking that rest! Thank you for sharing your insight! Whenever I do these month-long challenges, I try to get ahead a day or two so that the Sabbath’s posts are scheduled ahead. I agree with Beth about how fast you finished that sewing project. Wow! I had not really thought about the need to celebrate after a creative endeavor, but I guess I actually do celebrate in a way by sharing on social media. And a friend and I share our creativity with each other so that’s a way of celebrating and encouraging one another. I have thought about taking a break from creativity on Sundays, but sometimes the creativity itself is a form of rest, esp. if I’m doing collage. 🙂 By the way, I love you tip #4! I love nature. Blessings to you, Anita! Great post Anita! Really taking time to enjoy the moment is energizing in itself! God looked at each day of creation & saw that it was good! He celebrated! I’m guilty as charged or checking one major creative effort or task off the list and then diving head-first into the next one. You are spot on when you say we need to, like God did, sit back, pronounce what we accomplished as good, and then REST! It’s the rest that refuels the ability to create. Great reminder here this am. I hadn’t thought about it before but it really does make a difference when we stop to celebrate something we’ve completed before rushing on to the next thing we have to do! Here’s hoping that the next time, you remember to celebrate! I’m not good at this, but I see the importance of it, and want to do a better job of savoring the moments of loveliness God gives to me and my family. We miss so much when we just go crashing forward into the next item on the list! We should all learn to celebrate with family more often, shouldn’t we!? After all, when we get to heaven, there will be lots of family celebrations! “The bigger the project, the more rest and celebration we need when we finish it.” I love this concept, Anita. I often don’t celebrate like I should either, but what a beautiful bow to tie on a gift! I write with myself in mind, Lina ;). I forgot to celebrate after completing a big work project last year, and a kind co-worker took me out to eat for the express purpose of celebrating with me! It was so kind of her to think of it! One former pastor once said that when God rested after creation, it wasn’t a rest of tiredness but of completion. He was done – and He called it good. We do get tired and need rest that way, but it’s a great joy to celebrate when something is done, too. “A desire fulfilled is sweet to the soul” – Proverbs 13:19a. One thing I’ve been doing recently to express my creativity while worshiping the Lord is to pull out my Beautiful Word Bible! It is a coloring Bible… As I meditate on the word, I color in the verses. It is amazing how this method of worship helps me to focus on Him and what He has done and is doing in my life. It draws me into the place of praise and I find it is a wonderful way to celebrate the sabbath! I’ll have to look into that Bible! It sounds amazing and a lot of the girls I work with love to color :). You made a princess dress without a pattern and didn’t take a picture? WHAT? Go find that Princess and snap some pics. I must see! We all need to read other’s perspectives in order to broaden our own! I’d love to read your post!